As Jonah Hill himself would say, skateboarding attracts a certain type of person to the sport – the kind who can fall down and get back up again, over and over. The man who has become known as comedic gold for his acting chops in such films as Superbad, Forgetting Sarah Marshall, 21 Jump Street and The Wolf of Wall Street, when it came time for Hill himself to step up and situate himself behind the camera, most would expect the star to retreat into familiar territory and deliver a gut busting line-o-rama type of feature. Lucky for fans everywhere, that’s simply not the case. With his directorial debut, Jonah Hill offers up a unique coming of age tale that uses skateboarding as a vehicle to tell a story about youth, and the result is a heartfelt picture buzzing with raw power and defiant energy. 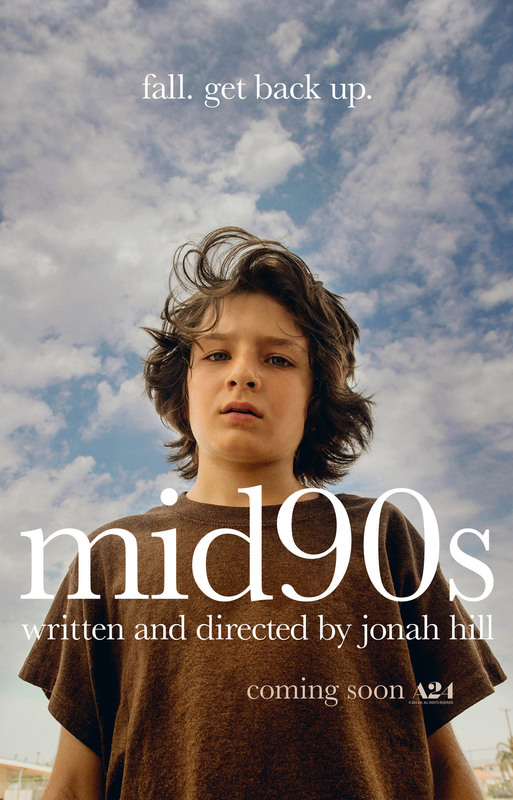 This is Mid90s, and it’s one hell of a movie. Starring Sunny Suljic (The Killing of a Sacred Deer) as the thirteen-year-old outsider Stevie – or “Sunburn”, as his peers would later dub him – the story follows the young lad as he clears a path through his tumultuous domestic life and into the world of skateboarding. At home, he’s the runt of the litter, babied by his single mother, constantly physically abused by his older brother Ian (Lucas Hedges), and occasionally dueling out some hurt onto himself by way of whatever household item is laying around. The idea of wiping out on a skateboard doesn’t seem that scary to Stevie, because nothing could match the shame and pain that he feels within the confines of his own house – it’s just another hit to take. At least when he’s shredding, the pain serves a higher purpose. Taking hits at the skate park means having friends around to pick you back up, like Ray (Na-kel Smith), Fuckshit (Olan Prenatt), Ruben (Gio Garcia), and Fourth Grade (Ryder McLaughlin), a.k.a. the posse who Stevie has fallen in with since he grabbed a board and set out to the blistering hot summer streets of L.A. Although he finds a wholesome type of inclusion with his new gang, most of the kids he hangs around with are much older than him, providing Stevie with a newfound confidence he had not yet previously known, while also simultaneously causing him to grow up way too fast. Obviously, most of us did not grow up skateboarding, but through some excellent casting, director Hill manages to reach the kid in all of us anyway. In a brilliant move, Hill combats the jaded movie goer who has seen it all by putting Sunny Suljic up front and center, a boy who is young and innocent looking enough to elicit sympathy from the viewer, but whose swagger and naïve determination makes him a companion worth following. It’s hard not to root for Stevie, as he does his best to puff out his chest and appear fearless in the face of his older and more experienced friends, while secretly just being overjoyed at the notion of being included. There’s something sweet and relatable about Suljic’s performance, a boy who is quickly making a name for himself in the cinematic world, but who still carries that light in his eyes that lends itself to curiosity and unfiltered emphatic joy. Adding to the film’s authenticity is the fact that aside from Suljic, most of the boys in the movie have never acted before. Bound and determined to set his work a part from the other butchered versions of skateboarding onscreen, Hill opted to go an unusual route for his debut feature and cast real skateboarders in the roles of Stevie’s friends, as opposed to casting actors and trying to teach them how to skate. Because of this, the viewer is never taken out of the film, never distracted by a poor attempt at an Ollie or a lame kickflip, and never annoyed by an obvious stunt double. The kids feel real because they are real, and the feature grows organically as a result. This may be his first feature as a director, but Jonah Hill has already proven himself as a force to be reckoned with. While some are quick to make the Kids association – a fair assumption given the film’s subject matter and the brief Harmony Korine cameo – the movie proves itself to actually veer down quite a different path from its predecessor, as it seeks not to show the nihilistic viewpoint of how pointless youth and everything that comes thereafter truly is, but rather, what untapped resources are waiting at our disposal should we choose to reach out and grab life by the board. If anything, the heart of the film strikes closer to Elephant, where every moment is captured in rapid fire constant motion (not to mention both films feature cinematographer Christopher Blauvelt), or This is England, where the cast comes across as a random group of people rather than a gaggle of well trained actors. Some are quick to point out the glorification and unhindered egotistical celebration of the male patriarchy, but writer/director Hill doesn’t shy away from the irredeemable behavior of young men as they set out to conquer the female population. Hill puts the ill deeds of his young cast on full display, showing the best and the worst of the skater punks, and illustrating how this sport can both make you and break you as a person – literally and figuratively. It’s clear that in Hill’s eyes, the sport that he grew up loving provided both a sanctuary on those nights when a young man just doesn’t want to go home, and a gateway to some truly detrimental behavior. It’s an honest depiction of how skateboarding can be both an escape from reality, and a way to carve out a new path for a better, updated reality, thereby showcasing the difference between what the world tells you you’d be good at, and what you choose to pursue. Love it or leave it, it can’t be denied that Hill has brought some serious gusto to his first feature film, and it will be thrilling to see what else this promising new director has up his sleeve.